Accidental eccentricity is aimed to account for any unforeseen factor that may attribute to the torsional response. These sources can be broadly classified into two components, namely, uncertainty in geometry and material properties, and torsional ground motion. Recently, conventional approach of shifting the center of mass was reported to be inappropriate when accidental torsion is contributed from the torsional ground motion and an alternative approach was proposed for the single story buildings subjected to unidirectional ground motion. The alternative approach is further investigated in this paper so as to include the multistory buildings under bidirectional ground motions, given the accidental eccentricity. 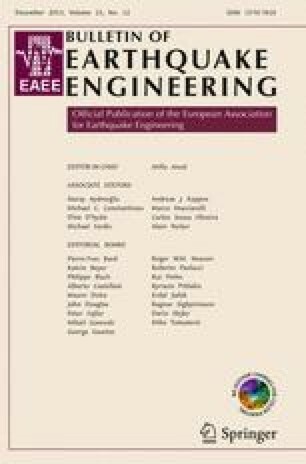 Also developed is a framework for evaluating the minimum required accidental eccentricity due to torsional ground motion that can be used in developing the seismic code recommendations. Even though the number of response candidates based on which accidental eccentricity can be assessed is many for a multistory building, this paper presents a simple recommendation for the vertically regular buildings. Funding for this study is received from the Summer Research Internship Program at Indian Institute of Technology Gandhinagar. The authors gratefully acknowledge the Institute of Earth Science, Academia, Sinica, Taiwan for sharing strong motion data. The financial support, technical review and provision of data are gratefully acknowledged.